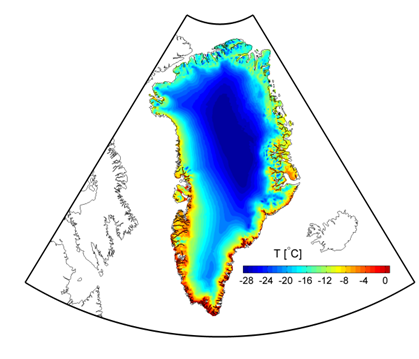 In this post I am linking to a dataset I have made available for the climate of Greenland. In my day job I run a Regional Climate Model (RCM) over Greenland called HIRHAM5 . I will write a simple post soon to explain what that means in less technical terms but for now I just wanted to post a link to a dataset I have prepared based on output from an earlier simulation. This tar file gives the annual means for selected variables at 0.05degrees (5.5km) resolution over the Greenland/Iceland domain. I am currently running a newly updated version of the model but the old run gave us pretty reasonable and could be used for lots of different purposes. I am very happy for other scientists to use it as they see fit, though do please acknowledge us, and we especially like co-authorships (we also have to justify our existence to funding agencies and governments!). This is just a sample dataset we have lots of other variables and they are available at 3 hourly, daily, monthly, annual, decadal timescales so send me an email (rum [at] dmi [dot] dk) if you would like more/a subset/different/help with analysis of data. This one is for the period 1989 – 2012. I have now updated it to cover up to the end of 2014. The new run starts in 1979 and will continue to the present and has a significantly updated surface scheme plus different SST/sea ice forcing and a better ice mask. 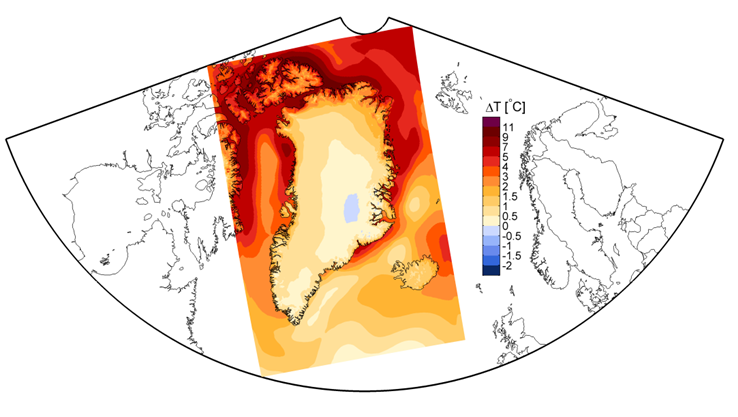 I have also done some simulations of future climate change in Greenland at the same high resolution of 5km using the EC-Earth GCM at the boundaries for RCP4.5 and RCP8.5 scenarios which could be fun to play with if you are interested in climate change impacts in Greenland, Iceland and Arctic Canada. Mean annual 2m temperature change between control period (1990 – 2010) and end of the century (2081 – 2100) under RCP45 from HIRHAM5 climate model runs forced by EC-Earth GCM at the boundaries. This plot shows the full domain I have data for in the simulations.